Here we go reviewing the Claro Alkaline Water Pitcher which is a product of a fairly sharp design. 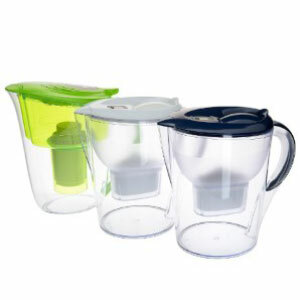 Most people fall in love with the green pitcher as it simply sits a little bit unorthodox and thus impresses everyone. There are 3 different colors of these jugs and even though they all have the same name, the models are 2 different ones. If you go with the green pitcher, you will need cylindrical filters for it. The blue and the white ones feature a regular rectangular (boxy) filter. These are pretty much all the differences between the two models. The work and the efficiency of the filters do not differ. The price of the pitchers and the spare parts is also the same making it completely up to you which one you want to buy. Check our buyer’s guide for more pitchers. The most important characteristic of the Claro Alkaline Water Pitcher is exactly the alkaline part. 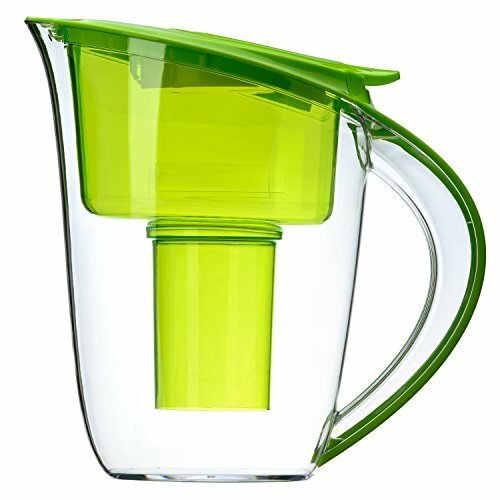 This pitcher will definitely make your water better for your health not only by cleansing it but also by adding alkaline and raising the pH levels. Any usual tap water would have pH levels of about 5 or 5.5. The ideal number here, however, is 7.5 – 9. With this Claro product, you get exactly that. A simple test shows that water, filtered by a Claro jug has its pH levels at about 8 – 8.5. Capacity is also very impressive. This thing will give you 3.5 liters or almost a gallon of fresh water every time you fill it up. Thanks to this volume, the life of the filter can be prolonged further. Since you aren’t refilling the pitcher 3 times a day, you really take it easy on the filtration system and it lasts longer. Unfortunately, with the Claro Alkaline Water Pitcher, you will also find a number of design flaws and some of them translate into functional disadvantages as well. The lid is definitely not the best part of this pitcher. If you tilt it too much, the whole lid might fall off as it is not well snugged. Additionally, the spring of the cap (small lid) is too flimsy and might pop out if you aren’t careful. A convenient addition is the counter clock which prompts you about when to replace the filter. Great, but after a few refills the device often malfunctions and you are stuck with tracking the life of your filter the old-fashioned way – with a calendar. It is obvious that Claro tried making a very potent and functional water filter pitcher as they added a number of perks and mechanisms. The big downside of this, though, is the fact that replacing filters can be quite the challenging endeavor. There are too many parts and your average housewife won’t have the time nor the knowledge to put back the whole contraption together. If you somehow manage to change the filter without destroying your nerves, then you have to get ready to prepare your water filter pitcher for use. To achieve that you need to run water through the filter for 2 full minutes. Then you are required to throw away the first 3 pitchers. It’s a blessing that you are not asked to go the forest and save a damsel in distress from a dragon before you can drink some fresh water from this jug. Perhaps the biggest knock on the Claro Alkaline Water Pitcher is that there is a big opening on top of the water reservoir. This gap allows water to bypass the filter and get into the already filter water below. If you fill the jug too much and too quickly this is exactly what will happen. Comes in 3 colors – this differentiation also gives you two types of filters to choose from – cylindrical and rectangular.